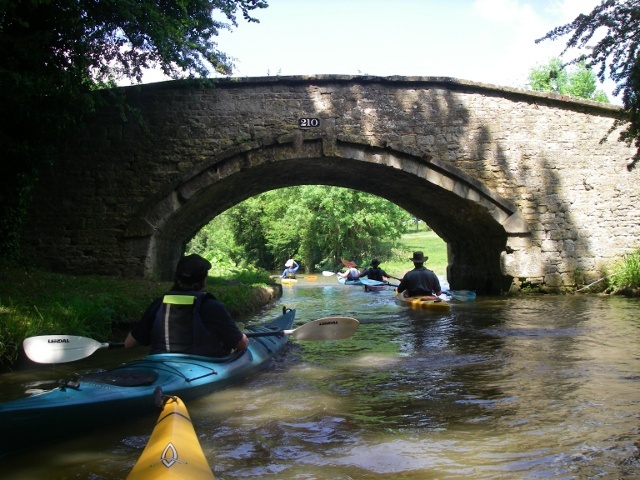 On 31st May, six Isis CC members followed Raymond Evans on a beautiful trip down the River Cherwell and up the canal taking in the stunning views of Rousham House and grounds. Helen, Howard, Jen, Martin, Raymond, Rich and Simon started early on Sunday morning, arriving at the boat hut to load boats and kit before setting off in convoy to the get in. 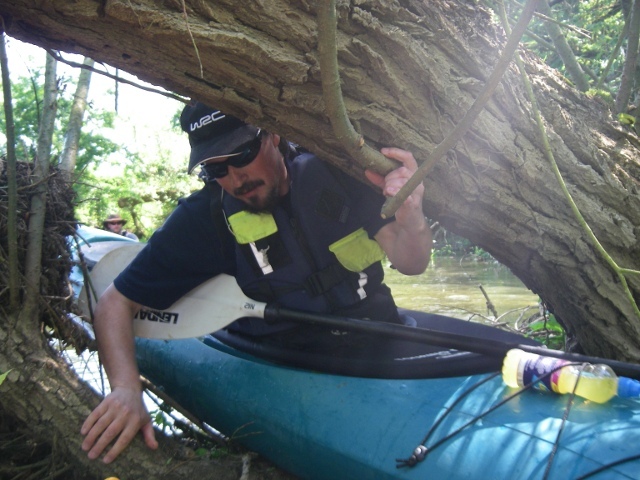 We set off up the canal initially, but then soon made a portage across to the Cherwell. We decided to take the fun route through onto the river by getting in above the low bridge with the small drop on the other side so we could slide through under the bridge and shoot through for some photos. We continued down the river enjoying the sunny day. 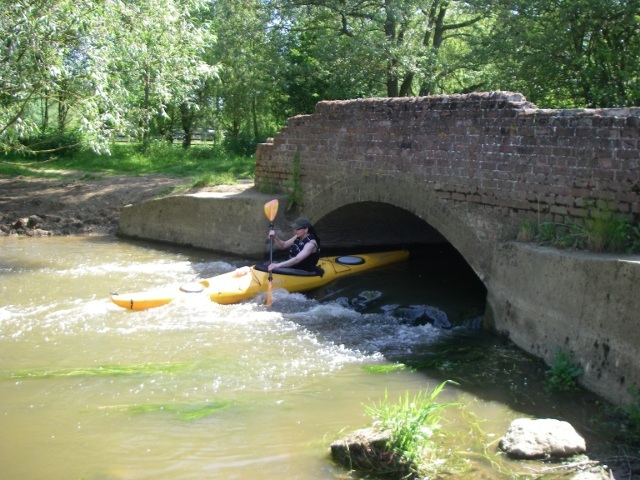 We soon realised, however, that this would be no normal Sunday paddle and we would be making use of the skills Simon had taught us on his mystery tours. No kayaks in trees this time, but there were a few obstacles crossing the river for the first part of the trip and we made our way under low hanging branches, with the sunlight dappling down onto the water through them, over fallen tree trunks, and through a carpet of reeds which were in flower and it made it seem like we were paddling through a meadow. We wound our way down the twisting turns and finally arrived at Rousham House, looking somewhat like a castle, with its beautiful grounds filled with classical arches and statues on rolling lawns. We continued on for a short distance and decided to have a break in a field overlooking the river. We sadly chose an unfortunate get out point which smelled like a cow's bum, and for good reason, the cows who usually lived in the field had left a few presents for us at the water's edge. We moved down the bank a little and had some elevenses, which turned into an early lunch. Simon decided to munch on his hot dogs, which had ingeniously been concealed in his thermos of boiling water, slowly cooking as he paddled. We carried on past a field of rowdy cows who almost stampeded as we paddled past and we eventually made our way to the next get out where we portaged across to the canal for our return trip. The canal made the second leg of the trip simple and sedate as we paddled past the myriad of barges and birds eventually making our way back to the get in spot where we loaded the boats back on the cars and moved through to a cafe where we sat in the garden under a tree and enjoyed a refreshing cider next to the canal. A beautiful day thanks to a perfect choice of route, and a massive thanks to Raymond for arranging a lovely paddle.